Robert Bresson’s Pickpocket (1959) is about Michel (LaSalle), a man compelled to steal from others. He works the streets, subways and train stations of Paris taking money from unsuspecting victims with his nimble fingers. He wears a plain, non-descript suit with average looks. He could be anyone and this helps him in his vocation, allowing him to slip in and out of crowds of people and go largely unnoticed. One can quickly see the profound influence Pickpocket had on screenwriter Paul Schrader (who contributes a video introduction on the disc) and his work. The outsider who wanders through the busy city and is compelled to commit criminal acts all the while recording these accounts and his thoughts in a diary is reminiscent of his protagonists in Taxi Driver (1976), American Gigolo (1980) and Light Sleeper (1992). Pickpocket explores the psychology of Michel. Why does he steal? What motivates him to do what he does? Bresson’s movie shows the process by which Michel steals from somebody on a busy subway. Part of it is dexterity, but it also involves patience, picking the right moment, and, of course, luck plays a role. Initially, Michel’s technique is quite rough, almost non-existent. We see it develop over time, tracing the development of an inexperienced thief into a skilled pickpocket who can select his victim and then take their money without them realizing it. Watching Michel and his fellow pickpockets work in tandem on a busy train is a marvel of dexterity and timing as they fleece a mark, pass off their wallet to another accomplice and then move on to another victim in a series of fluid motions. Michel’s only chance at any kind of redemption lies with Jeanne who is his only friend, his only tenuous connection with normal society. Along with Jean-Pierre Melville’s Le Samourai (1967), Bresson’s Pickpocket influenced numerous crime films that came after it. The Blu-Ray upgrade really shows off the detail apparent in this transfer, especially in the close-ups. Fans of this film will want to upgrade from their existing DVD. “Paul Schrader Introduction” has the veteran screenwriter and filmmaker talking about Pickpocket’s influence on his work. He discusses its themes and Bresson’s technique. Schrader talks about how Bresson used traditional film techniques in an unconventional way. There is an audio commentary by film scholar James Quandt. He briefly examines the films and filmmakers influenced by Pickpocket. 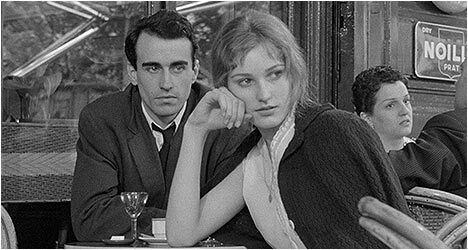 He also cites it as one of Bresson’s most accessible movies and also one of his richest. Quandt dissects in great detail the film’s style and its themes on this informative track. “The Models of Pickpocket” reunites three cast members: Martin LaSalle, Marika Green and Pierre Leymarie more than 40 years after the film was made. It is interesting to find out what they are doing now. Each one talks about how they were cast and what it was like working with Bresson. “Cinepanorama” is an interview with Bresson on French television in 1960. He would rather people feel the film before they understood it. The director was not interested in employing traditional theatrical techniques. “Q & A on Pickpocket” features actress Marika Green and filmmakers Paul Vecchiali and Jean-Pierre Ameris answering questions at a 2000 screening of the film in Paris. Green says that Bresson was attracted to her naivete and talks about meeting LaSalle after 40 years at a film festival in Mexico. “Kassagi” features sleight-of-hand artist and the film’s pickpocket consultant showing off some of his tricks for French television in 1962. He certainly has a flair for the theatrical as he pulls of a series of impressively staged tricks. Finally, there is a theatrical trailer.